Your hands are almost always in perpetual motion. Consequently, any piece of jewellery attached to your hands or the area close to your hands is sure to garner plenty of attention. 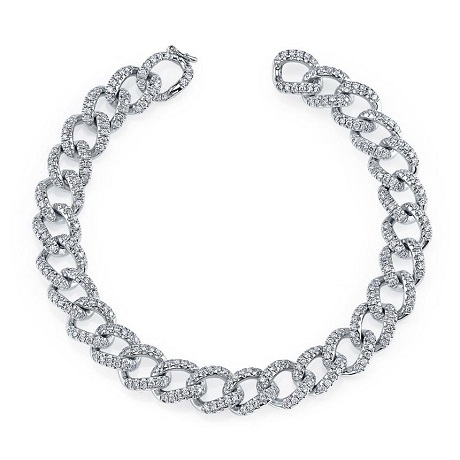 A diamond bracelet is a simple jewellery addition that can have the most dramatic results. Set with diamonds, our selection of intricate bracelets and bangles will sit delicately on your wrist to provide you with a touch of glamour and sparkle. Diamond Bracelets come in a variety of settings and styles, each with their own idiosyncrasy. They can be worn on any occasion, can be dressed up or down, and are always in fashion. A bracelet is fitting for many occasions. Read more about the origin of the tennis bracelet, discover the many bracelet styles, and review different categories of diamond bracelets in this guide. You can also find tips on how to select a setting for your bracelet, measuring the correct length, and selecting the best diamonds for your bracelet. There are many variations of bracelet styles, including line/tennis, bangle, charm, link, and cuff. Because your bracelet may come into contact with hard surfaces in daily life, you should look for top quality bracelets crafted to be durable enough to withstand regular wear. There are several styles of diamond bracelets for all purposes and people. Take a look at our options to see what could be right for you or your special someone. The tennis bracelet is one of the most popular types of fine jewellery. The history of the diamond tennis bracelet started when the famous tennis player, Chris Evert, lost her diamond bracelet during a match. The clasp on her diamond bracelet snapped, causing it to fall off, and when this happened, she asked the game officials to pause the tennis match until her jewellery could be located. 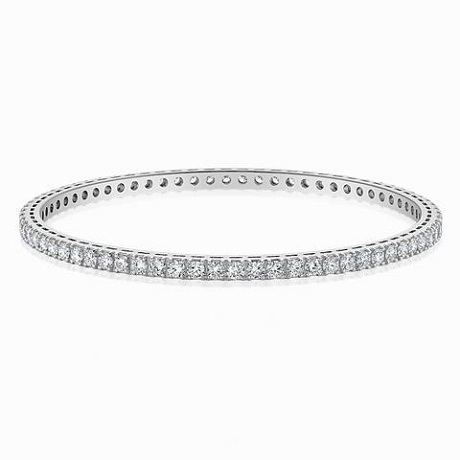 Ever since that day, line diamond bracelets have been coined "tennis bracelets." 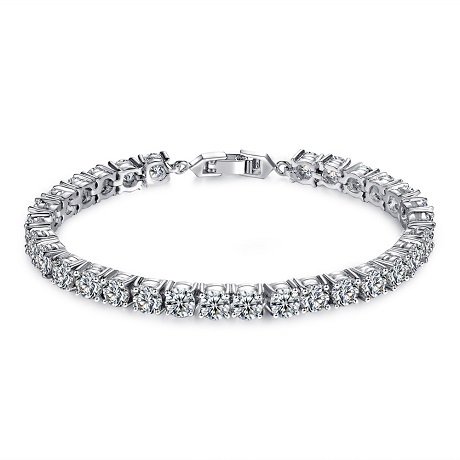 A classic tennis bracelet is the most versatile accessory a woman can own. 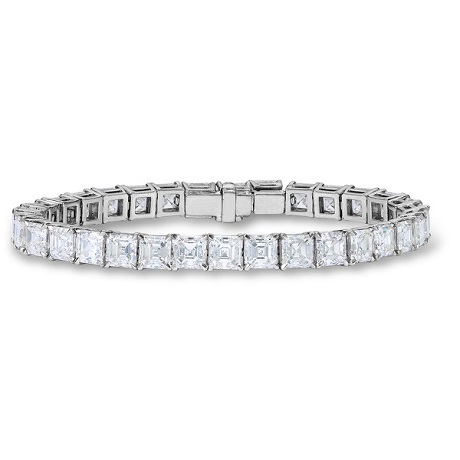 A traditional tennis bracelet can range from a simple three or four prong setting to a bezel or channel set design. This bracelet category has many designs that can be worn with any outfit. They are an everyday jewellery staple. Very similar to the Line Bracelet, as a rule of thumb, a Tennis Bracelet usually does not contain square or rectangular shaped stones. There are 3 or most often 4 prongs that actually grasp the stone (unless it is Bezel-Set where some of the metal actually covers the stone along the edge). 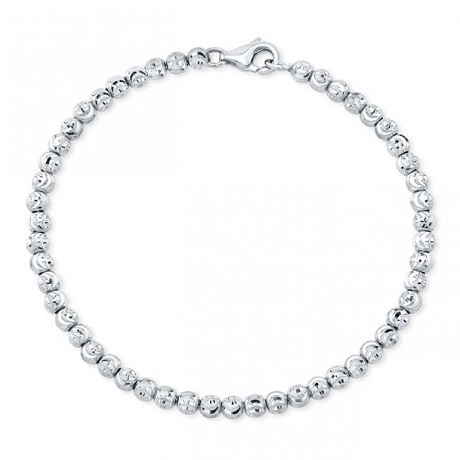 As a result of the way it is set, tennis bracelets are much more flexible than line bracelets. The setting is comprised of a thin wire that comes off each basket, goes through the next basket and around back to its own basket. This type of setting can move in different directions and is far more flexible than that used in the line bracelet. Bring on the bangles. This style has a circular shape and is inflexible. Bangles are usually made of gold or other types of metals, and can come in simple or engraved designs. Make an elegant statement with diamond or gemstone embellished bangles, or stack a bunch of different tones for a fun look. Bold beauties. Beaded bracelets feature precious gemstones in a wide range of colors. You'll find stretch bracelets, as well as expandable bangle pieces in single or multi-row designs. Also look for ones with a silver or stainless steel clasp. Start a chain reaction! Chain bracelets or link bracelets are made by connecting links together into a band and typically has a clasp closure. This style is usually made of a type of metal, like gold or sterling silver, and can be worn as a plain chain or with charms. This one's a charmer! This type of bracelet has little trinkets or charms hanging from a chain or link. Look for styles you can customize and find the perfect pieces to show off your personality! Line Bracelets usually contain square or rectangular shaped stones or at least some square or rectangular shaped stones so that an actual line is created along the sides of the stones. The line is achieved with the use of a basket that is 'Peg-Set' or 'Prong-Set' so that the stones are grasped and held in place. Each basket is interlinked. Line bracelets remove the chain as the predominant feature and make the stones the central feature. Consequently, they are more ostentatious than chain bracelets and may be better suited to evening wear or formal events. The interplay of a line with the round or oval shape of the bracelet makes for an interesting interplay of shapes, especially when considering the shapes of the stones used. However, as a result of the link, line bracelets are not very flexible, they can move up and down, but will not be able to move laterally. Bolder is better! 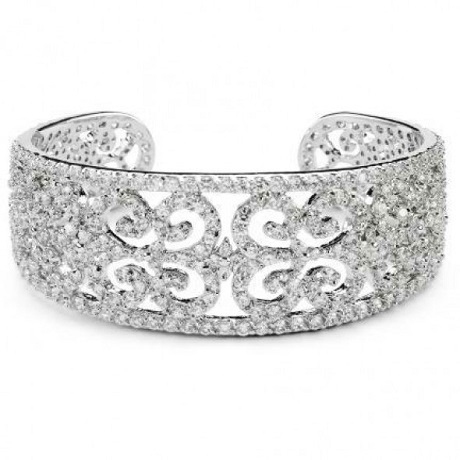 Cuff bracelets are a type of bangle bracelet and have an inflexible circular or oval shape. They tend to fit a little looser on the wrist, are usually wider and chunkier, and don't have a clasp or closure. It's all in the wrist. Slider bracelets have an adjustable closure that can be changed to fit any wrist size. Just like the size, the designs are unlimited, too! Mix, match, layer or stack slider bracelets featuring beads, charms, gemstones, links, multilayered cords and much more. The bracelet setting refers to the metal base that holds a stone in place. There are many choices for setting types including prong, channel, bezel and half-bezel. All setting types are equally secure and is a matter of preference. The prong setting is the most popular for diamond bracelets and consists of small metal prongs which bend over the girdle of the gem. Channel setting refers to a type of stone setting often used in mounting a number of small stones of uniform size in a row. Instead of each stone being held by its individual set of prongs, the stones are fitted into the channel and held into place on each side by a continuous strip of metal. A Bezel setting completely surrounds the diamond with metal. A semi-Bezel setting, or half-Bezel setting, is when the diamond is only partially surrounded by the metal setting. Designer diamond bracelets are more deluxe than an everyday tennis bracelet because of their unique designs. Still appropriate for any occasion, these pieces have an extra element that transforms them into one-of-a-kind design. Some designer bracelets are offered in two-tone metal, which is a mix of white gold and yellow gold. Be the star of the show with a red carpet diamond bracelet. This collection includes the most extravagant designs. If you are looking for a bracelet to wear to at a special event and turn heads, this is the perfect collection for you. Each of these dynamic bracelets is carefully crafted to catch the eye. If you need something remarkable to wear to a special occasion, incorporating one these beauties will ensure you arrive in style. For vintage jewellery enthusiasts, this antique diamond bracelet category is full of timeless designs that combine the highest quality materials with exquisite, timeless style. Many bracelets in this category feature intricate details that draw attention or special edging details such as milgrain or filigree surrounding brilliant diamonds. The addition of gemstones to diamond bracelets creates a collection of dazzling styles that truly stand out from the rest. The pop of gemstone color adds extra interest to these designs, while the sparkle from each diamond truly shines. A bangle bracelet is another jewellery staple as it fits for any occasion. Bangles are usually a set size of seven inches in length. The bangle bracelet length is not adjustable. Choosing the quality of diamonds for your bracelet is a very important task and requires that you keep two factors in mind: the total diamond carat size and your budgetary limits. When it comes to carat size, the bigger the diamond (millimeters) and carat weight, the more visible any blemishes or coloration issues will be. If you are choosing a bracelet which features fairly large stones, opt for a 'better' to 'best' diamond quality combination. If the bracelet features smaller sized diamonds, then 'good' to 'better' quality diamonds should be fine. Decide on a budget for your bracelet and use the product configuration to create the perfect diamond bracelet within your budgetary limits. What Length Bracelet Should I Get? 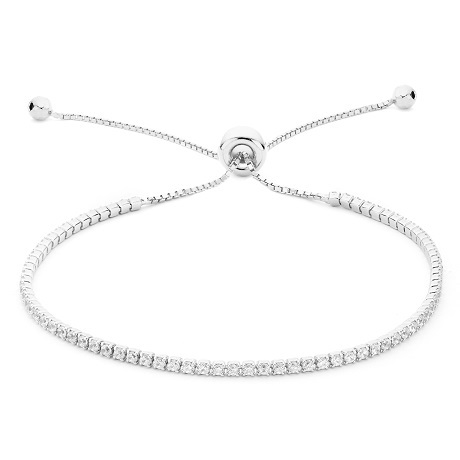 Flexible styles such as the line/tennis bracelet are available in different lengths. Before you purchase, measure one of your own bracelets to be sure you don't need a special length. When ordering a line/tennis bracelet, the guideline is usually the natural wrist measurement plus half an inch. With this bit of room on the wrist, the bracelet will sit comfortably without falling too far down your arm. When measuring an existing bracelet, you generally do not need to include the clasp or the tongue portion of the bracelet when measuring. The standard length for women's flexible bracelets is 7" and the standard for men's bracelets is 8". Bangle bracelets are usually 7" standard length. See our Bracelet/Bangle Size guide.